Fat cell differentiation (FCD) potentiates adipose cell characteristics including lipid storage and insulin sensitivity. In vitro, we have demonstrated that CCN2, also known as connective tissue growth factor (CTGF), inhibits FCD in NIH3T3-L1 cells and in adipocytes isolated from mouse epididymal fat pads. 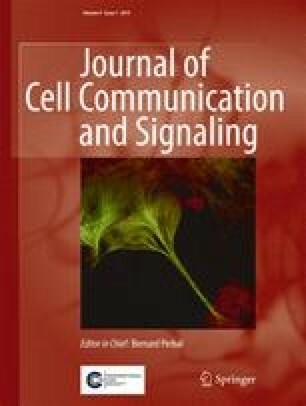 The aim of this study was to determine if the CCN2 effect on FCD is dependent on TGF-β and TGF-β downstream pathway signalling. NIH3T3-L1 cells were differentiated using standard methods with IBMX/Dex/Insulin. FCD at day 10 was confirmed by induced gene markers resistin and adiponectin and by lipid accumulation. Cells were treated at d0 with single dose active rhTGF-β1 (2 ng/mL), rhCCN2 (500 ng/mL) and/or TGF-β type 1 receptor blocker (SB431542, 5 μM). Early induction of FCD transcription factors: CCAAT/enhancer binding proteins (C/EBPs) and peroxisome proliferator-activated receptor-γ (PPAR-γ), were also determined. In an early time course from 2 h, single doses of rhTGF-β1 or rhCCN2 significantly inhibited by ~70 % the induction of C/EBP-β and -δ mRNA, and also nuclear protein levels otherwise seen during FCD, whereas only delayed effects on PPAR-γ, at 48 h, occurred. Furthermore, the CCN2 inhibition of FCD markers adiponectin and resistin and lipid accumulation by Oil red O stain were each prevented by TGF-β receptor blockade. Similar prevention was found using pan-specific anti-TGF-β neutralising antibody. CCN2 and TGF-β treatment each rapidly phosphorylated SMAD-3 signalling in early stages of FCD. This work shows novel findings that CCN2 effects on FCD are both TGF-β and TGF-β pathway dependent and are related to early effects on C/EBPs. This work was supported by a National Health and Medical Research Council (NH&MRC) of Australia Project Grant #457373, to SMT, RCB and SVM.